Find out how this no-bake Cherry Cheesecake gets its amazing height. Fluffy? Yes. 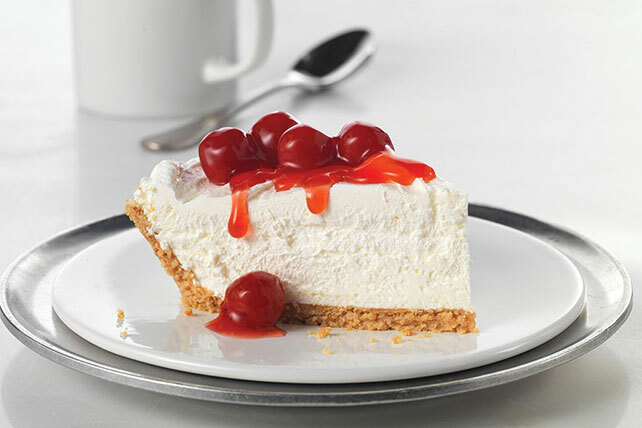 But this Cherry Cheesecake is sure to dominate the dessert table. Beat cream cheese and sugar in large bowl with whisk or mixer until blended. Stir in COOL WHIP. Refrigerate 3 hours. Serve topped with cherry pie filling. Save 50 calories and 6g of total fat, including 6g of sat fat, per serving by preparing with PHILADELPHIA Neufchatel Cheese, COOL WHIP LITE Whipped Topping and a ready-to-use reduced-fat graham cracker crumb crust. Prepare as directed, omitting cherry pie filling and using one of the following flavor options: Fluffy Caramel Pecan Cheesecake: Spread 1 cup cream cheese mixture onto bottom of crust; top with 1/3 cup caramel ice cream topping. Sprinkle with 1/4 cup chopped toasted PLANTERS Pecans; cover with remaining cream cheese mixture. Fluffy Cranberry Cheesecake: Stir 1 cup canned whole berry cranberry sauce into the cream cheese mixture before stirring in the COOL WHIP. Fluffy Apple-Topped Cheesecake: Top with 1 sliced apple just before serving. This cheesecake is equally delicious without the cherry topping.